​INTRAcel is the latest development in skin tightening and facial rejuvenation developed in the Far East. As well as tightening the skin it also stimulates fibroblast regeneration and thus the skin not only looks better but is healthier too. 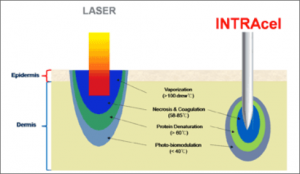 Unlike laser which always has maximal effect at the surface, we can chose the exact depth of the treatment with INTRAcel so we can vary our effect depending on the skin thickness in that area. INTRAcel delivers reliable results, with minimal pain, little or no downtime and outstanding improvements to your skin. >How long before I can return to my normal activities? Treatments will be specific to you, normally 1 to 3 INTRAcel treatments are required. Your medical practitioner will advise you. A maintenance plan is also recommended.